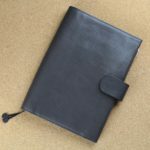 The Gillio Appunto range of leather planner covers was initially released in March 2016. They originally came in both A6 and A5 sizes and have been joined by ‘Slim’ and B6 sizes. The Appunto was originally designed for the Hobonichi style planners, but any notebook/planner of the same size will fit in to these covers.